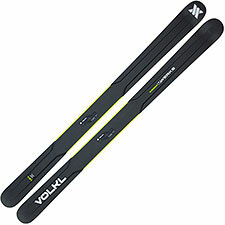 New for the 2013-2014 season is Volkl's Katana Carbon, a V-Works carbon-fiber version of Volkl's Big-Mountain Katana. What the heck is 'V-Works', you ask? It's a light-is-right design/construction ethic that Volkl is introducing to its Alpine line. Admittedly, the Katana Carbon is something of a odd bird: weight would seem to be an asset—not a liability—for a Big Mountain ski. Nevertheless, the Katana carbon makes considerable effort to shed weight, including the obvious utilization of carbon fiber, plus a hybrid ultralight wood core, plus an incredibly thin/cutout profile (reminiscent of racing A/T ski boot designs). V-Works technology notwithstanding, I'd argue the carbon version of the Katana doesn't make much sense as a true, lift or heli-serviced Big Mountain plank. But, thanks to its lower weight, The Katana Carbon might make sense as a powder-oriented touring or sidecountry ski. For the money, you're getting a lot of flotation here—in fact, at 112 millimeters underfoot, we're not that far off the raw dimensions of Volkl's powder-beast Shiro. Unfortunately I haven't been able to get a spec weight for the Katana Carbon, which is important, because I think weight is going to be the decisive metric for this ski. If the Katana sits in the 8-pound range, it joins the class of touring-oriented powder planks like K2's Backdrop, Black Diamond's Justice, or even Volkl's Nunataq, and likely compares favorably with them all. On the other hand, if the Katana's weight pushes it more toward the Alpine category, the ski's performance really isn't competitive with beefier planks. On the hill, the carbon Katana has a feel that is very much in the Mantra tradition, though not quite as quick and slashy. Like the Mantra, the Katana prefers to make short radius turns right down the fall line, and balks at smooth long radius turns (especially on hard snow). Edge grip generally lags what we expect from a modern Alpine All-Mountain ski, though it's certainly credible for a touring ski. Thanks to all that carbon, you get a very damp ride from the Katana—perhaps a little too damp. Subjectively, the ski is reasonably neutral, but rather bland overall. Certainly the Katana Carbon is not in its element on hard snow, but even on soft snow, there isn't much sizzle to be found. I suspect the Katana's cutout profile introduces too much torsional flex, compromising liveliness. I'll reserve final judgment on the Katana Carbon until I'm sure how much it weighs. There are touring and powder skiers who love high-flotation low-weight planks, and if the Katana delivers in that regard, I won't hesitate to call it a success. But for in-bounds All Mountain duty, I found it sleepy and bland. If weight isn't an issue, there are better skis to be had.